i've been cramming in heaps of sewing in the evenings the past two weeks after work as the weekends have been filled with family visiting in bendigo and i whipped up these easy baby wraps in a couple of hours (should have been quicker, really, but bias binding and i still aren't on the greatest of terms). 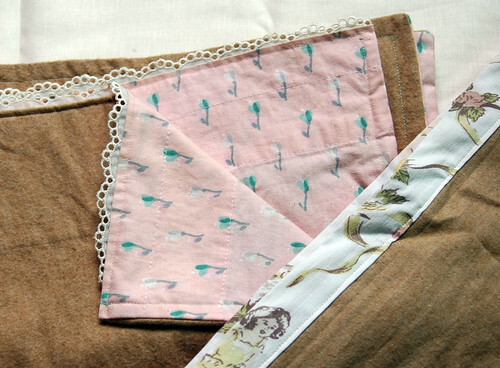 just simple, soft pieces of thick cotton flannel, one bound with a vintage cotton print and the other backed with a lovely pink cotton print with a bt of vintage lace added. sweet and easy, just what i like. Good luck on your 'marathon blog post' - i'll be popping round to read!